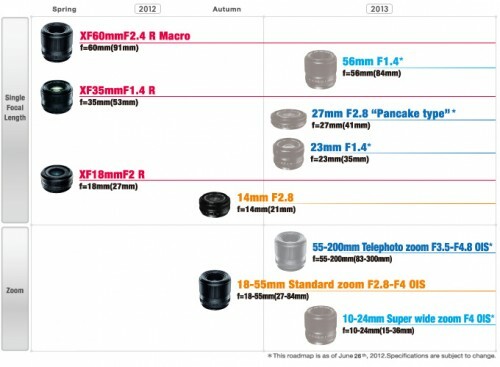 Fujifilm has published a lens roadmap for their popular X-Pro1 digital rangefinder system. The plan covers the rest of 2012 and 2013 and adds 7 new lenses, including three zooms, for a total of ten X-Mount lenses. A new 14mm f/2.8 prime (21mm equivalent) and an 18-55mm zoom (27-84mm equivalent) should be available by the end of this year. 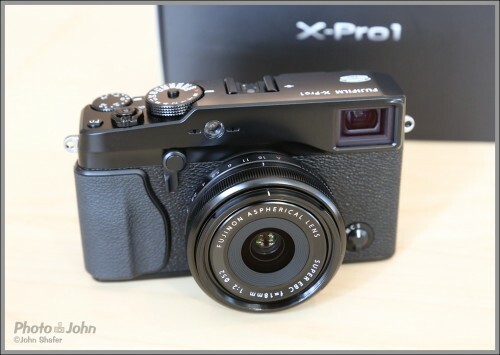 The Fujifilm X-Pro1 is one of the most exciting cameras of 2012. It builds on the popularity of Fujifilm’s X100 – a fixed lens digital rangefinder with a unique hybrid viewfinder. That hybrid viewfinder is a critical part of the X-Pro1 lens roadmap because it makes using zoom lenses possible. Traditional rangefinder cameras have fixed non- “TTL” (through-the-lens) viewfinders with guides in the window that match standard prime lens views. Since the optical viewfinder can’t zoom and doesn’t see through the lens, you can’t accurately use a zoom lens with a rangefinder camera. However, the X-Pro1’s hybrid viewfinder can be used in either a standard optical, or an electronic (EVF) mode, which gives you a live TTL view in the rangefinder window. Being able to electronically see through the lens allows the use of zooms as well as prime lenses. Bonus – the EVF also shows you all the exposure data and allows you to play back images – something you’d normally have to look at the LCD display to see. The hybrid viewfinder, a really good sensor, auto focus and the forthcoming zoom lenses give the X-Pro1 a unique position in the camera world, somewhere in between a traditional rangefinder and a digital SLR. The first of the new X-Mount lenses will be a super-wide 21mm equivalent 14mm f/2.8 prime and a standard 18-55mm f/2.8-4 OIS (image-stabilized) zoom lens (27-84mm equivalent). Those lenses are scheduled to be introduced this fall – probably at the biennial Photokina tradeshow in Germany. The other five lenses are planned for 2013. They include three primes and two more zoom lenses. The prime lenses are a 56mm f/1.4 (84mm equivalent) – perfect for portraits; a 23mm f/1.4 (35mm equivalent) wide-angle – a standard rangefinder street photography lens; and a super-compact 27mm f/2.8 “pancake” lens (41mm equivalent). There are also two more zoom lenses in the works – a 55-200mm f/3.5-4.8 OIS telephoto (83-300mm equivalent) and a wide-angle 10-24mm f/4 OIS (15-36mm equivalent) zoom. No prices or exact release dates have been announced for the new lenses but we’ll let you know when more information becomes available.